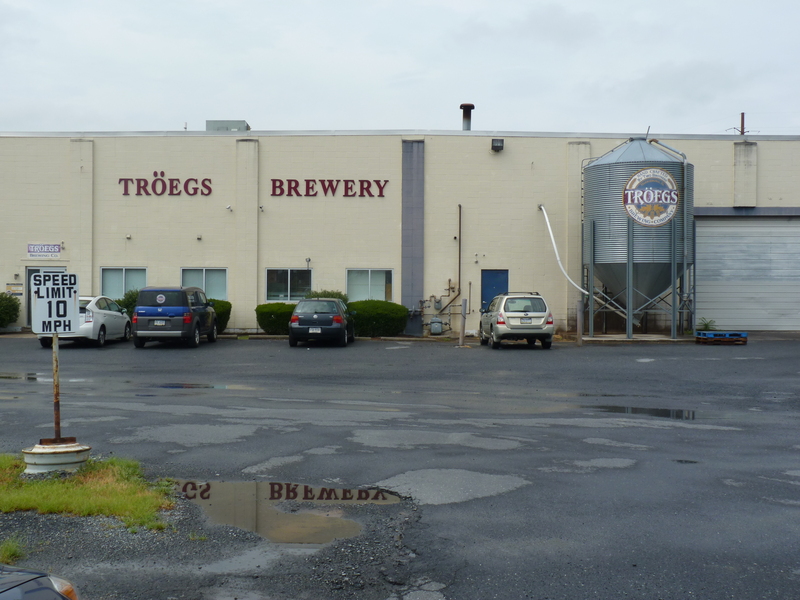 A thunderstorm during a recent family trip to Hersheypark afforded me a few hours to visit the nearby Tröegs Brewing Company in Harrisburg, PA. 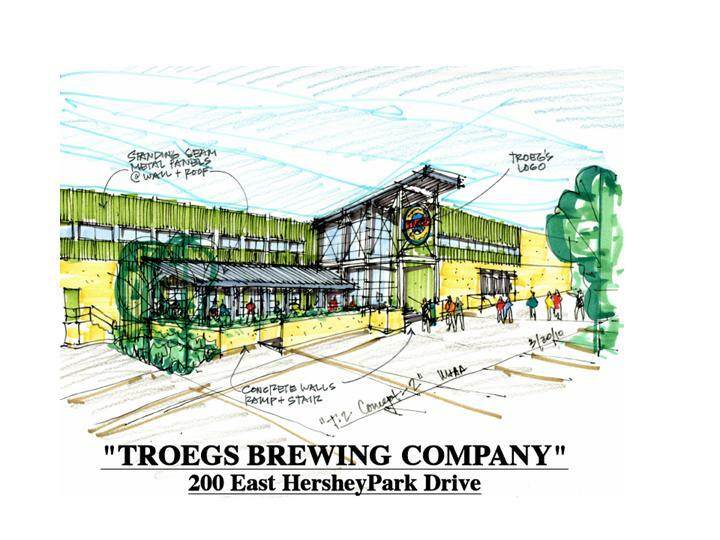 Renowned amongst Aleheads for beers like Nugget Nectar (a best-in-class Imperial Amber Ale) and Mad Elf (a strong holid-ale brewed with cherries and honey), the brewery will move ten miles east in the fall to a shiny new state-of-art complex in tourist-stricken Hershey, PA. While no tours were being conducted this day, I knew it would be my last chance to see a great American ale factory and Pennsylvania brewing institution in its current incarnation. 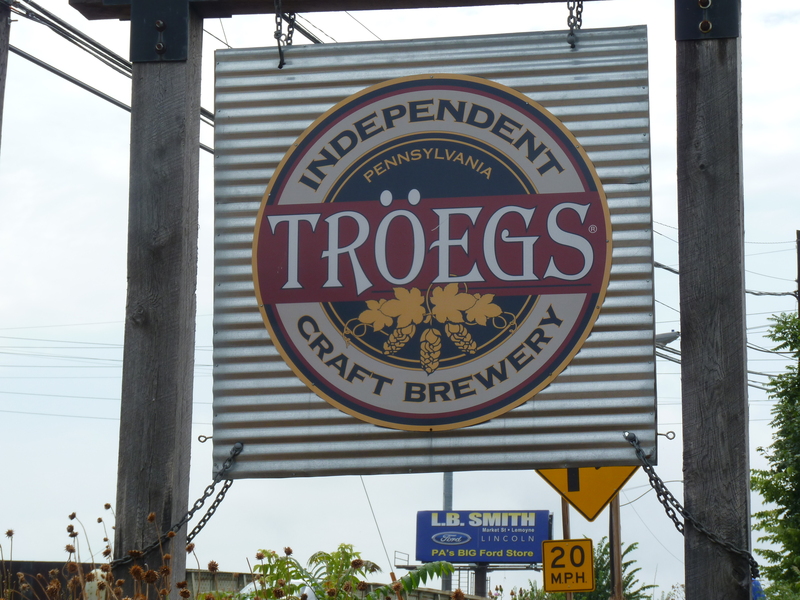 Located just south of the Pennsylvania state capitol building and downtown Harrisburg, Tröegs is set in a gritty industrial plot among a busy network of freight train tracks and manufacturing plants. 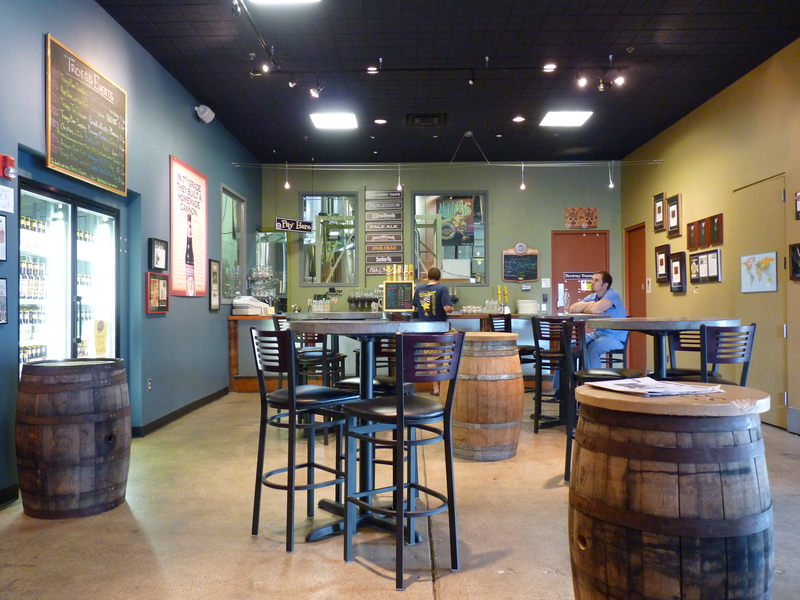 Upon entering the taproom, visitors are transported into a a cheery and inviting beer space with high ceiling and large inward-facing windows through which to view the brewery production floor. Unable (unwilling?) 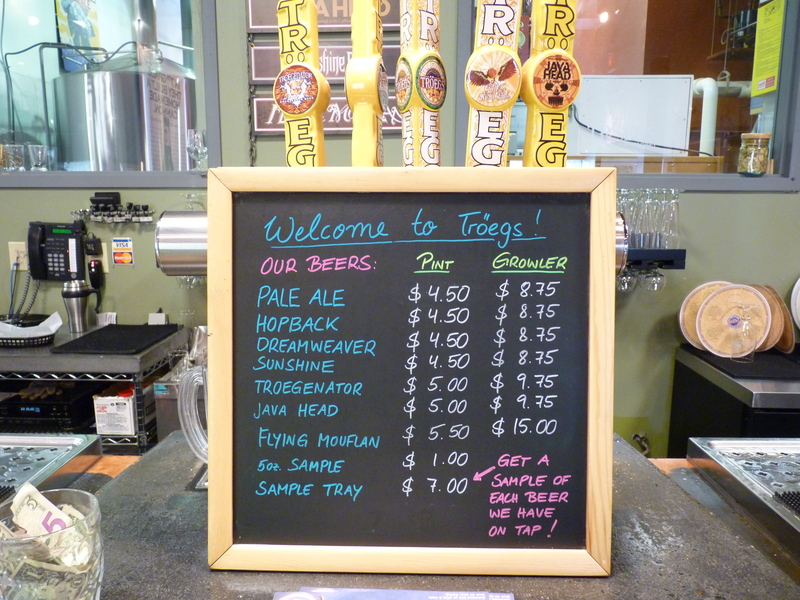 to choose, I ordered the Sampler featuring seven Tröegs brews, which at seven dollars seemed a peach of a deal. 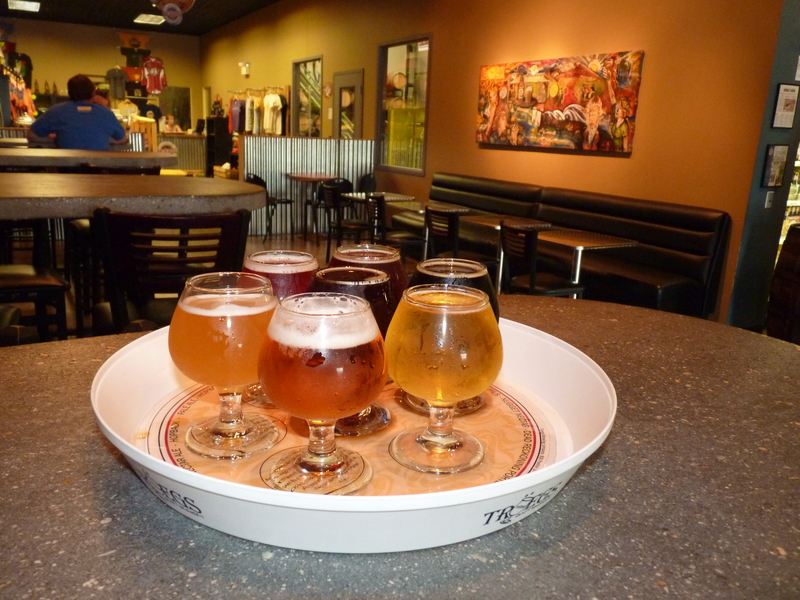 I carried my tray of snifters to a table that gave me a view of the brewery floor and began to make my way through the beers (light to dark of course). 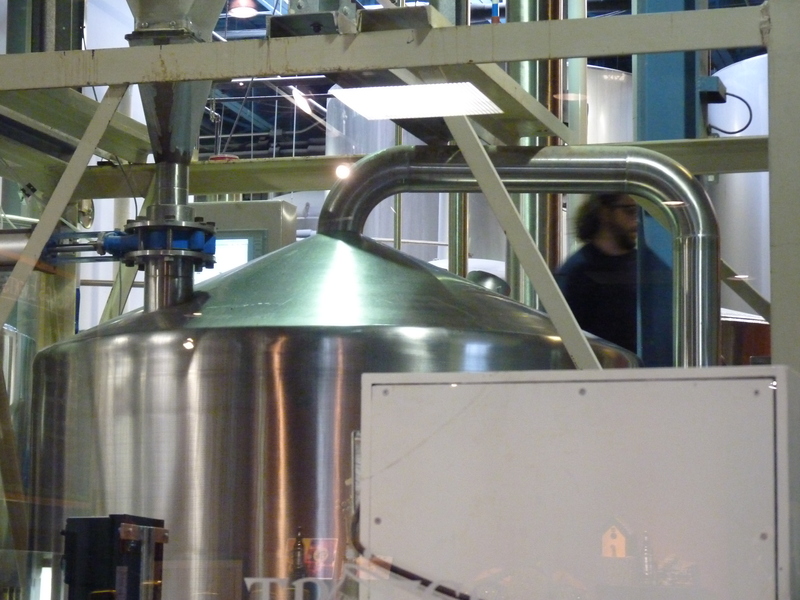 Ah yes, there is also a fully functioning commercial brewery on premises. 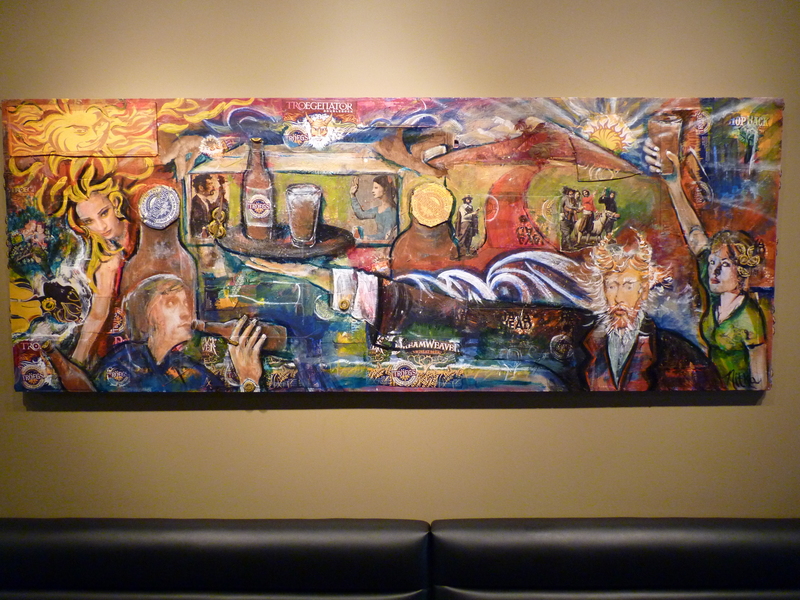 You can sit and watch the brewers bustle about, doing God’s work. No, seriously. Hail the Tröegenator. Is this a brewery or the new student union? 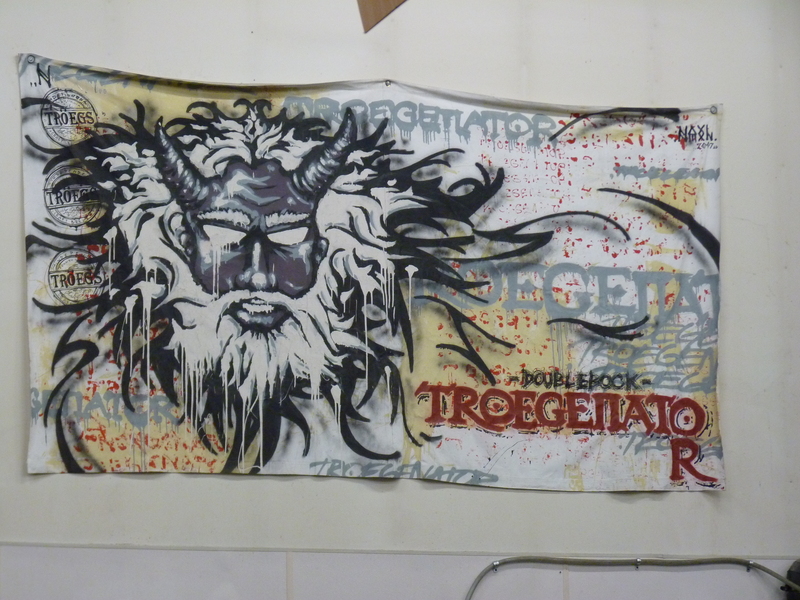 Tröegs currently distribute to only ten eastern states, but that will be changing with increased capacity from the move to the new digs. Give their brews a try if you see HopBack, Nugget Nectar or others on your local store shelves. Or better yet, request them from your distributor. You won’t be disappointed. 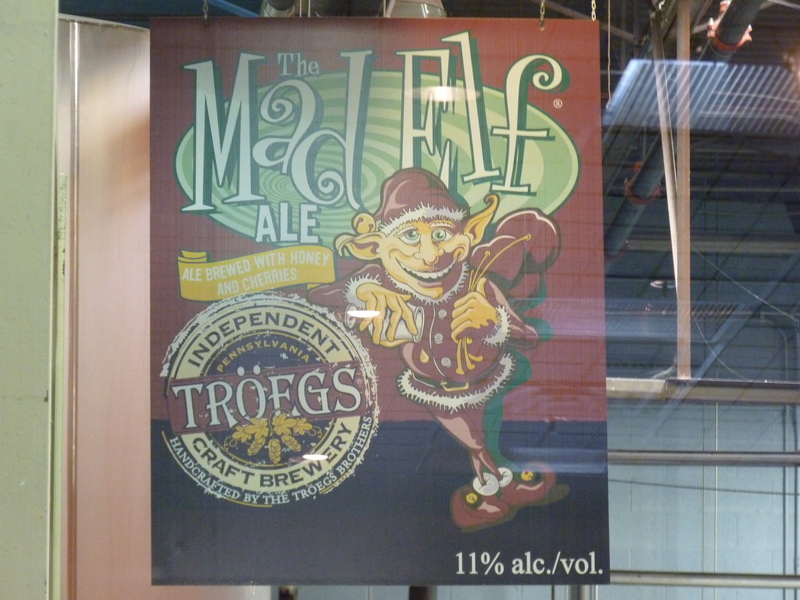 Posted in Ale Factories, Tasting Notes, Travelogues.Tagged Harrisburg Pennsylvania, Hersheypark, Tröegs Brewing Company. Wait, so it was about $5 a pint, or you could get 35 ozs. of sampler for $7? 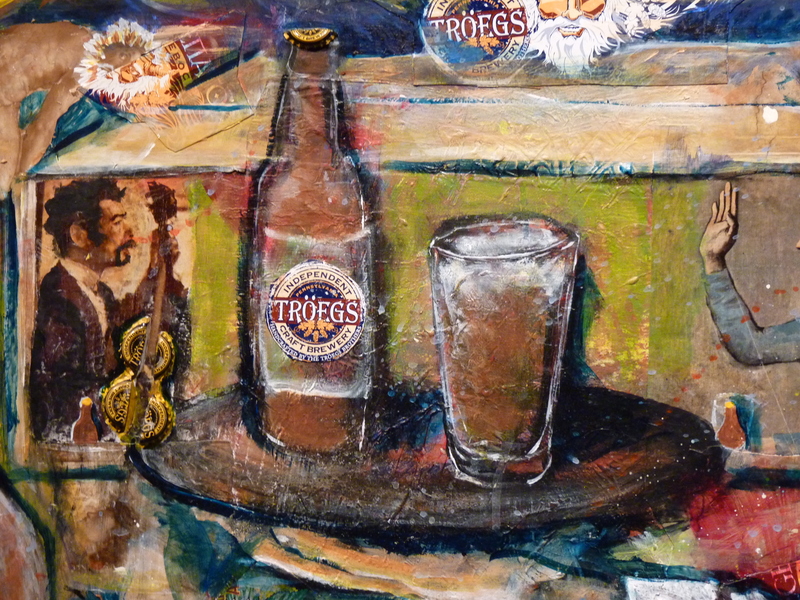 I have new found respect (for Troegs, not for you). Indeed… you could also make like a monk and live off the “liquid bread” Tröegenator for $9.75 per growler. A pint for breakfast, a pint for lunch, and two pints for a sensible dinner. I do not think the monks live(d) on 8.7% ABV double bocks. 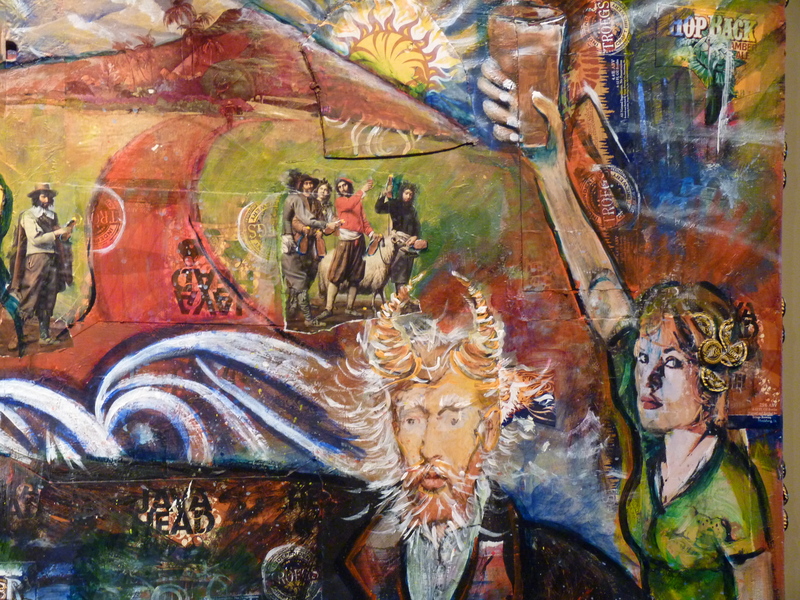 I refuse to believe in a past without drunk monks. I’m pretty sure the barrels are not filled with mad elves. 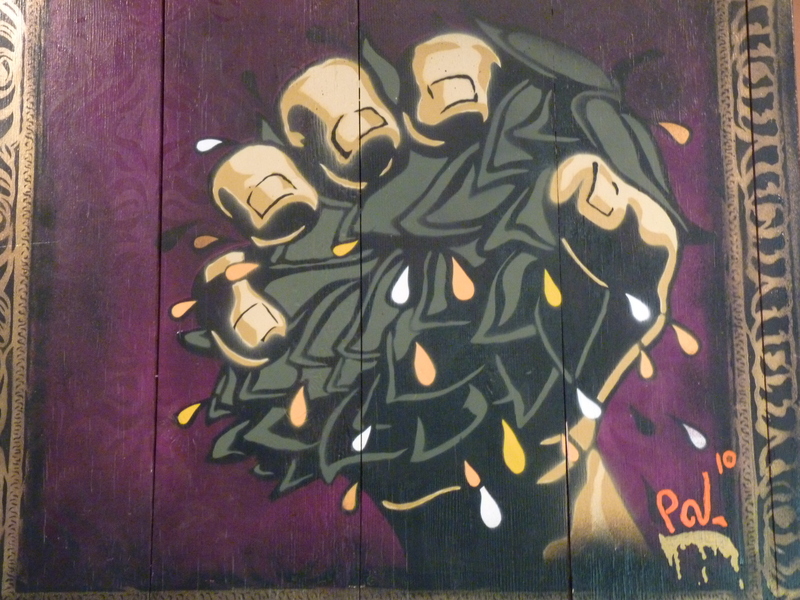 They are filled with beer that will eventually be their second “Splinter Series”. Ah… Splinter Series= wood-aged? I get it. I want to go to that new facility they’re building real bad. 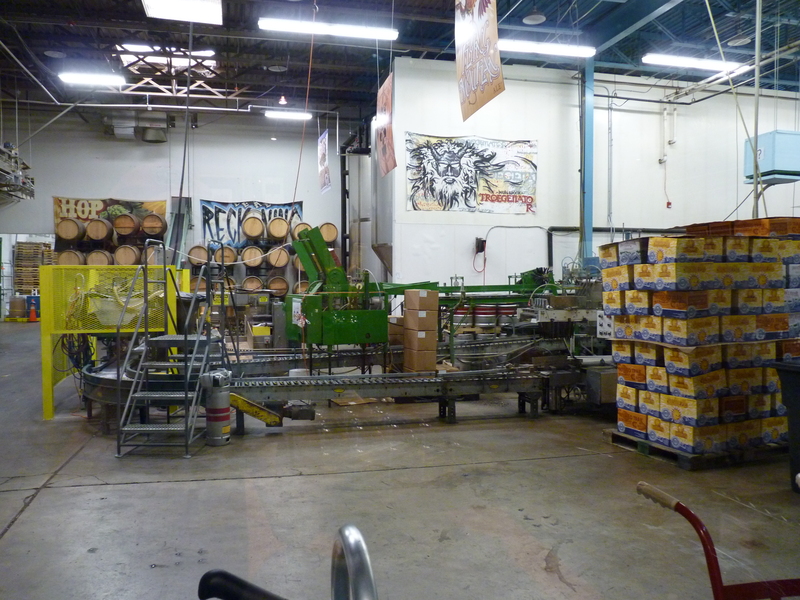 And then I want to do a swan dive into the hop storage bins.